If you have a Tormach PCNC machine with their passive touch off probe you’re bound to break the tiny ceramic tip at some point. 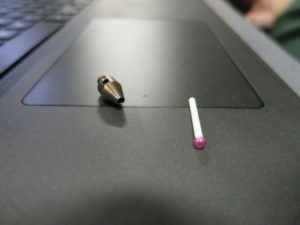 There’s two strategies, one is to buy a new one with a carbide or stainless steel tip but then if you crash it you might damage the probe itself – the alternative is to upgrade to a thicker boss by purchasing a non-Tormach replacement. 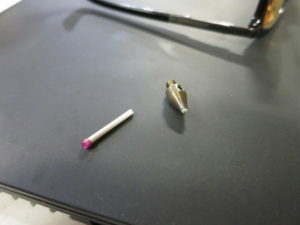 Either of those doesn’t help you with your current problem – finishing the job you started with a non-broken tip! I ended up trying to drill out the broken off chunk of ceramic with carbide tooling but to no avail. What did work great was heating up the probe tip with the broken ceramic stuck in it with a propane torch, the glue burns off and the broken ceramic chunk will fall out. You can then superglue whatever you’ve got left of the tip back in. 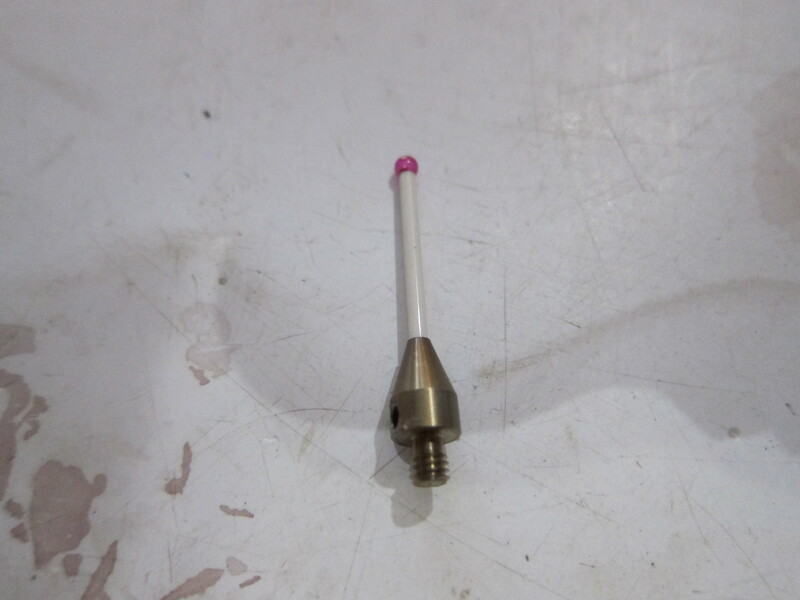 Of course you’d think this would mess up the precision of the tool but that’s why you have to calibrate the probe in the first place, because it’s not glued in precisely initially. Slightly shorter and the stainless steel is a little crispy looking – but it works fine! Go forth and save your $90 on the replacement, at least for the first time until it ends up too short! This entry was posted in Failure, Mechanical on October 11, 2015 by Waterppk. Warning – this post was sitting in the drafts, I don’t know how helpful it’ll be but it’s been sitting for 5 years – may as well release the information and hope it helps someone. START = "G21 ;Metric is good"
START = "G90 ;Absolute Positioning"
FIRST_RAPID_RATE_MOVE = "G0 [X] [Y] [Z] [F]"
RAPID_RATE_MOVE = "G0 [X] [Y] [Z]"
FEED_RATE_MOVE = "G1 [X] [Y] [Z]"
Your RepRap will not allow you to cross the Z axis, so when MeshCAM creates the gcode and moves the position to positive Z to clear the work surface, your RepRap will toss this command and destruction will ensue. . . Figure out your retract height, in my case I set it to 2.5mm so I can easily remember it. You want to take this number, then set your stock size to fit geometry (or as needed), but make sure you add your retract height to the stock height and put it in the Z Position. For example, I have a 5.08mm block I’m machining, with a 2.5mm retract height. So I would define my Z Position as 5.08+2.50 or 7.58mm This will result in your retraction remaining less than 0mm and the machine will actually retract away from the workpiece. This entry was posted in Uncategorized and tagged gcode, MeshCAM, RepRap on August 4, 2010 by Waterppk. mutt you@domain.com -a /home/username/backups/archives/mysql_backup.$suffix.tar -s "MySQL Backup"
This entry was posted in Webdevelopment on July 18, 2010 by Waterppk. I’ve been wrenching for a few weeks to machine enough pieces to create a CNC plastic extruder (RepRap / Makerbot). I’ve got the CNC part done, now I have to get the extruder and heated bed up and running so I can start RPing parts. I’ve gotten a few questions as to what you’re looking at, if you’re completely unfamiliar a visit to Wikipedia should clear things up. It’s made out of 2″ x 2″ extruded aluminum channel, the railed looking stuff that makes up the top of the arm and the drop for the spindle (dremel) is called 80/20, it’s fairly expensive but is very precise and saves a lot of time for some projects. The Z axis is the classic over constrained parallel rods, I pulled the rods out of a pair of identical printers and then drilled and reamed to size the end blocks and the slider block, which is just a chunk of delrin plastic. The bad part about using a plastic block for a sliding surface is that you have a drill/ream it over significantly to get it the right size, which in my case just means it’s sloppy and will be replaced by linear bearing when it becomes the weakest link in the machine for precision or stiffness. The bottom end X-Y axes are THK precision linear bearing. I picked this out of discarded equipment at the university, which I understand it not available to “normal people”. I found out a few years after I picked it up that it’s $0.43/millimeter (yep, that’s a half of a dollar per the thickness of your fingernail, it’s expensive). The bearing carriages are ~$130/each. I was fortunate enough to find a pair of 18″ linear track and a pair of bearings still in their well oiled bags! They do have lash in them and should certainly be run in parallel or with a precision guide track for stiffness/rigidity but for my application (milling light plastics and depositing plastic in an additive process) it’s not a major concern this early in the project. The other common question is how much does this thing cost. So far I have $199 for the full generation 3 Makerbot electronics (thanks Zach et al., they work great!) and $4.11 for 3 x 1″ long 1/4-20 nuts that are used on each of the axes (True Value). The rest has been collected or given to me by others. 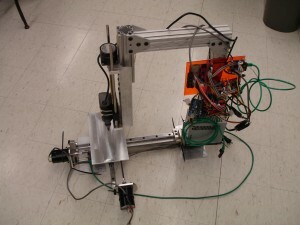 This entry was posted in Arduino, College, Electronics, Mechanical Engineering and tagged CNC, Makerbot, RepRap, RepStrap on June 28, 2010 by Waterppk. Yes, abnormal delay between posts, I’ve been very busy. . . This entry was posted in College, Random Thoughts and tagged Fun, Water skiing on June 28, 2010 by Waterppk. These are a few of my favorite stores. . .
MPJA Ships from Florida, cheapest breadboard prices I’ve ever seen, not sure about anything else. This entry was posted in Electronics, Mechanical and tagged Cheap Junk, College Budget on March 20, 2010 by Waterppk. 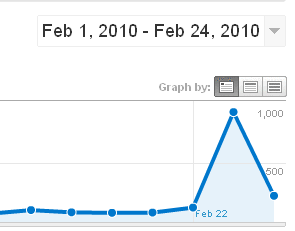 I was checking my web traffic today to notice a massive surge in traffic, I immediately feared for the worst and figured I got hacked. . . This entry was posted in Random Thoughts and tagged 9V Conversion, Lego Tracks on February 24, 2010 by Waterppk. The words grn and blk are silkscreened on the board to denote which pins are which. You could of course use a RS232->TLL converter to program this as well, but using the Duemilanove is really convenient as it pulls the reset pin low for you. On the topic of this Pro Mini board, I had a few e-mails back and forth with Sparkfun trying to figure out what the actual maximum input voltage for the board is, Sparkfun’s Website lists it at 12VDC max, the EagleCAD schematics list it as 16VDC, and the datasheet for the voltage regulator list it as operational maximum 16VDC, with an absolute maximum of +/-20VDC before damage occurs. 15hours 37 minutes elapses, the Duemilanove is exactly in sync with the stopwatch still, the Pro Mini has gained 1 minute and 1 second. I ran this test several more times with identical results, the stop watch and the Duemilanove are in sync, with the Pro Mini gaining time each time, always about 20 second per 5 hours elapsed time, which is not acceptable in my application. I swapped the Sparkfun crystal/resonator for one of my own resonators and ended up with the same crappy timing. I finally switched out the resonator for a crystal and a pair of capacitors tied to ground and was able to clean up the timing mostly, it’s still gaining a second for every 40 minutes it runs for, it was previously 15 so it’s improved, but not ideal. I’m going to ditch using the Sparkfun board for my own layout on the next iteration. This entry was posted in Arduino, Electronics and tagged Arduino, Arduino Pro Mini, Sparkfun on February 20, 2010 by Waterppk. If you’ve ever used NI’s DIAdem for data analysis you know how useful it is for looking at and analyzing large datasets. What you may or may not have discovered is the @@——@@ commands that can be used to display channel related texts anywhere in the program. DIAdem helpfully gives you a list of available commands, but doesn’t tell you what they display or how to use them. Notes: Make sure to use quotes around the Property name and remember that the channels are counted from the very first channel onwards and found as “Number” in the channel information. Output: Finds the 2nd group’s first channel and returns it’s channel number (counting from the first channel. Notes: Could be considered translating from relative position of a channel (in a group) to absolute position in the list of channels. Otherwise it’s pretty helpful to use these when labeling graphs/etc so you don’t have to constantly correct things. DIAdem also builds in lots of string functions like trim/etc, so you can clean things up if necessary! This entry was posted in College, LabVIEW and tagged DIAdem, LabVIEW, National Instruments, Program Variables, Special Variables on February 17, 2010 by Waterppk. I created a little SMT board for the MAX6675 thermocouple amplifier in EagleCAD if anyone out there is in need of a board. It’s very simple layout but it is a bit noisy, definitely expect to average samples coming from this chip (/board?). Other improvements would be adding a thermistor as the CJC (cold junction compensation) on the board so you can accurately offset the junctions at the board where you break the thermocouple wire and transition over to copper (which creates another TC junction unintentionally so you must compensate for it). This entry was posted in Arduino, Electronics and tagged Amplifier, Arduino, EagleCAD, Interface Board, K-Type, TC on February 9, 2010 by Waterppk.